SC-550 Stealth This light control siren puts the traffic clearing power right in the palm of your hand. The SC-550 Stealth hand-held control and remote 100/200-watt amplifier is ideal for undercover and unmarked vehicles, as well as other applications where being inconspicuous is desired, console space is limited, or remote mounting is needed. It's rugged, low-profile design provides additional operating stability whether you run it as a true hand-held, mounted on the dash, or next to you on the seat. 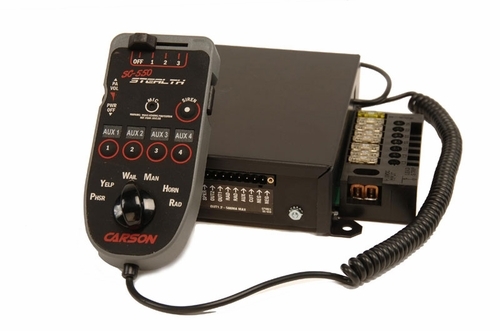 The SC-550 Stealth Siren features several DIP switch programmable options including the Horn Ring Cycler 2 (HRC2) function that enables the driver to cycle through the siren tones with the vehicles horn and Siren Cutout / Park Kill to disable the siren when exiting the vehicle. The control head is LED backlit and the amplifier and light control circuits are protected by external fusing, short circuit, high voltage and reverse polarity protection systems. The siren is installed using a wiring connector with screw-down terminal for the siren while the vehicles lights are connected using heavy-duty screw-down terminals. As with all Carson Sirens products, the Stealth siren is backed by a no-hassle 5-year limited warranty. Easy to install as far as sirens go, works well. control is nice and sturdy.